Emperor goose hunting in the fall-winter season is open to Alaska residents by registration permit and to nonresidents by drawing permit. Beginning in the 2018-19 season, Alaska residents also may hunt emperor geese by proxy during the fall-winter season. Over 30 years of conservation efforts have helped emperor geese recover from a low population size to allow their harvest. However, the population is still vulnerable to overharvest; therefore, federal regulations allow the State of Alaska an annual harvest quota of 1000 emperor geese. 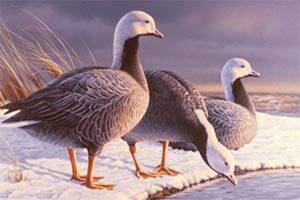 The Alaska Department of Fish and Game (ADF&G) and the Board of Game established 7 hunt areas across the range of emperor geese each with an individual quota that together add to 1000 birds. A hunt area will close after shooting hours on the last day of the season or by Emergency Order when the area quota is met. Thus, it is important that successful hunters follow the reporting requirement of the registration permits and report their harvest of an emperor goose during the required time period to minimize overharvest and possible hunt closures the following year. If you are interested in hunting emperor geese, please see the information below for details of obtaining a registration, drawing or proxy permit, season dates, hunt conditions, and reporting requirements. Twenty-five nonresident waterfowl hunters have an opportunity to harvest an emperor goose in Alaska by drawing permit. Nonresidents can apply online (hunt.alaska.gov) beginning November 1and ending December 15 at 5 p.m. (AKST) for a drawing permit to hunt emperor geese during the next year's fall-winter season. The permit allows a nonresident hunter the harvest of ONE emperor goose per season. Starting in the 2018-19 season, an Alaska resident (the beneficiary) who is blind, physically disabled, or 65 years of age or older may be eligible to have another Alaska resident (the proxy) hunt emperor geese on their behalf. Contact your local ADF&G office for a proxy authorization form, and additional information about the requirements and restrictions of proxy hunting.